It will be amazing to know that there is not a single moment in our daily life when we do not encounter a wave. Let it be in the form of light waves, sound waves, water waves, radio waves etc, waves are always a part of our life. Considering a slinky as an example after we stretch a slinky from end to end, it naturally comes back to its original equilibrium rest position. So here we can notice that a wave passes through the slinky as a disturbance is generated due to our stretching it. This disturbance passes through the slinky and after some time gets it back to its original state of rest. A wave is usually described as the disturbance that passes through a medium from one location to another location. A wave medium is a substance or material that transports the wave from one location to another location. Here it is to be noted that the medium simply carries the wave from one point to different locations, but the medium does not play any role in creating or generating a wave. For instance, we can notice the waves in an ocean. The medium through which the water waves travel in an ocean is the ocean water. For a sound wave, the medium through which the sound wave travels is the air present in the room. A single disturbance that passes through a medium from one point to another point is known as the Pulse. However, if the disturbance is continuously repeated causing it to become a periodic disturbance that moves from one location to another location, then that disturbance is described as the Wave. Medium is a collection of particles that have the ability to interact with each other. Due to the interactions between a particle and its adjacent particle, the disturbance travels through the medium. The constant push or pull between the neighboring particles allows the disturbance to spread across the medium. However, it is to be noted that the individual particles of the medium are only temporarily displaced from their original rest position. Eventually every particle carrying the wave return to their original position. Therefore, we can say that a wave transports energy from one location to another location but it does not transport matter. Due to this reason we can see that in an ocean waves are seen to move through the water, however the water always returns back to its rest position. Only the energy is being transported through the medium, but the water molecules are not transported. 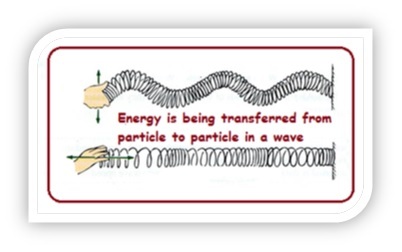 Therefore, a wave can also be described as the disturbance that travels through a medium (with the help of particle interaction) carrying energy from the source to another location, without transporting matter. Waves can be classified into 2 types based on the ability to transmit their energy even in vacuum or only through a medium. The waves that travel through a medium that is a solid or a liquid or a gas (at a speed which depends on the elastic properties of the medium) are known as the Mechanical waves. Based on the direction of the individual particles of the medium to the direction of the travelling wave, these mechanical waves are commonly classified into 2 types. The wave in which the particles of the medium move in a direction that is perpendicular to the direction in which the wave travels, is known as the Transverse wave. For instance, if the energy of the wave is transported from left to right, then the individual particles in the medium are displaced upwards and downwards in a transverse wave. Transverse waves are always characterized by the property that the particle motion is perpendicular to the wave motion. In order for the particles in a transverse wave to move perpendicular to the wave direction, they must be able to strongly exert a pull on its neighboring particle. Due to this reason, transverse waves require a rigid medium to pass through and hence these waves can usually pass through solids only. The wave in which the particles of the medium move in a direction that is parallel to the direction in which the wave moves, is known as the longitudinal wave. For instance, if the energy is transported from left to right, then the individual particles of the medium will be displaced leftwards and rightwards in a longitudinal wave. 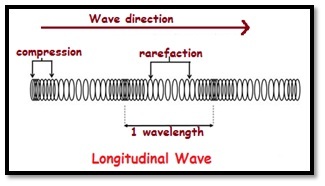 Longitudinal waves are always characterized by the property that the particle motion is parallel to the wave motion. Unlike transverse waves, longitudinal waves can pass through solids, liquids and gases. A sound wave passing through air from the speaker’s mouth to the listener’s ear is an example of a longitudinal wave. Seismologists have discovered that during an earthquake, the waves produced were both transverse and longitudinal waves as they could pass through the solid structures of the Earth, however only longitudinal waves were able to pass through the core of the Earth. Geologists therefore believe that the core of the Earth contains a liquid (mostly molten iron). Surface Waves: These are another kind of waves that are can be either elastic or seismic waves (seismic waves are the waves generated during an earthquake or an explosion). The motion of these particles decreases as we step away from the surface. In seismology (study of earthquakes), there are different types of surface waves and they are usually either Love waves (they have transverse motion) or Rayleigh waves (they have both transverse and longitudinal motion). The waves on the surface of the oceans and seas are also examples of surface waves. 2) Electromagnetic waves: The waves that are capable of transmitting the energy even through vacuum (or empty space) are known as the Electromagnetic waves. This implies that these waves do not need a medium to transport energy from one location to another location. These waves are produced due to the oscillation of the electric and magnetic fields. It is interesting to note that we use electromagnetic waves everywhere in our daily life. From the point of listening to a radio, watching television, or cooking lunch in a microwave oven, we are using electromagnetic waves every time. 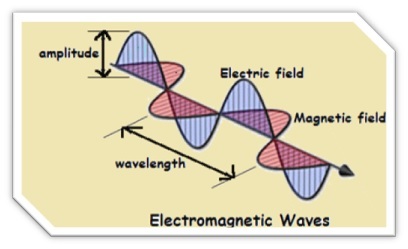 The radio waves, microwaves, ultra-violet rays, X-rays etc are all examples of Electromagnetic waves. We need electromagnetic waves for our very existence as the life-giving beautiful light rays emanating from the Sun that travel all through the outer space and reach Earth are also electromagnetic waves. In a transverse wave, since the particle motion is perpendicular to the wave motion, we can observe the maximum displacement reached by the particles from their original position. When a string initially at rest is disturbed, then we can observe that the particles of the string vibrate upwards and downwards, reaching maximum upward/downward displacement. In a medium, the crest of a wave is the point that exhibits maximum amount of upward or positive displacement from the original rest or equilibrium position. In a medium, the trough of a wave is the point that exhibits maximum amount of downward or negative displacement from the original rest or equilibrium position. In a longitudinal wave, since the particle motion is parallel to the wave motion, we can observe that there are certain regions where the particles are pressed together and other regions where the particles are spread apart. The region where the particles are pressed together in a small amount of space during the longitudinal wave motion is known as the Compression. This region is also said to have the maximum density as the particles are pressed tightly when the longitudinal wave passes through it. The region where the particles are spread apart in a small amount of space during the longitudinal wave motion is known as the Rarefaction. This region is said to have the minimum density as the particles are spread apart when the longitudinal wave passes through it. During the longitudinal wave motion, there are alternating compressions and rarefactions generated along the wave, as shown in the figure above. A wave motion has various properties and some of the terms that describe a wave are amplitude, wavelength, frequency, time period, etc. Amplitude: The maximum amount of displacement of a particle from its rest position during a wave motion is known as the amplitude. Amplitude is measured as the distance from the rest position to a crest or the distance from the rest position to the trough. 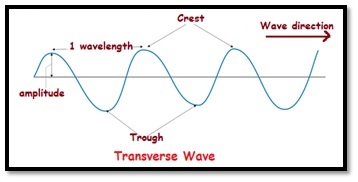 Wavelength: In a transverse wave, the wavelength is the distance between crest to its consecutive crest or from trough to its consecutive trough. In a longitudinal wave, wavelength can be referred to as the distance between consecutive compressions or consecutive rarefactions. Since a wave repeats itself periodically over time and space, hence a wave is known to have a repeating pattern. Therefore, the wavelength can also be simply measured as the distance from a point on a wave to the corresponding point on the wave’s next cycle. Frequency: It is the measure of the number of waves that pass through a fixed place in a given interval of time. This implies that in a given amount of time, the number of complete cycles of wave that passes through a medium at a certain point is known as the Frequency. Usually the units of frequency are given as cycles/second, vibrations/second, waves/second. However, the standard unit commonly used for frequency is ‘Hertz’ denoted by the symbol ‘Hz’. 1 Hertz is equal to 1 cycle/second. Examples: If a coil of a slinky makes 5 vibrations per second, then its frequency is 5Hz. If a coil makes 12 cycles per 3seconds, then its frequency = 12cycles/3seconds = 4Hz. iv) Time Period: During the wave motion, the time taken by a particle in the medium to make one complete vibrational cycle is known as the ‘period’ or the time period of a wave. Example: The period of orbit of the Earth around the Sun is approximately 365 days. Example: A period of 8seconds corresponds to what frequency? The wave equation is a mathematical equation which describes the relationship between the speed of a wave, the wave frequency and its wavelength. Example: If the speed of a wave travelling in a medium is 600m/s, then what is the wavelength of the wave if 1800 waves pass through a certain point in a minute? Therefore the wavelength of the given wave is 20m. Example: What is the frequency of the light whose wavelength is 600m? 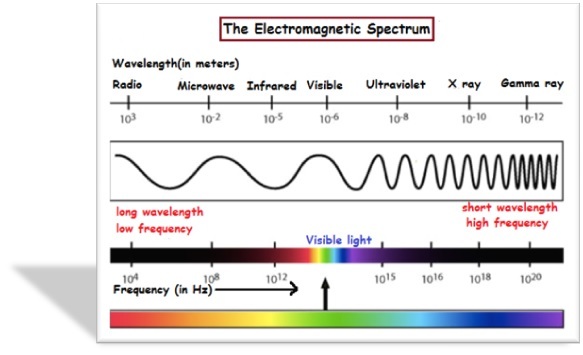 The distribution of electromagnetic radiation according to the energy, depending on factors such as wavelength and frequency is known as the Electromagnetic spectrum. All the waves including the light rays that our eyes can see, the microwaves, radio waves, X-rays, gamma rays etc. all belong to the electromagnetic spectrum. The visible light of the electromagnetic spectrum consists of the colors that we usually see in the rainbow.